This sounds stupid and obvious, but: don’t adjust handlebars while riding. If you get impatient and tempted to try a new angle for example as soon as possible, on the go, remember this. Make sure all the bolts are fastened tight before going for a test ride. Always. Get proper tools before starting. In the “heat of the moment” one can easily reach for a small flat bladed screwdriver in stead of a phillips, for example, “it will hold”. So inspect all the bolts on and around the handlebars and make sure you have all the right tools. Usually it is allen wrench 4, 5 and 6, flat and phillips screwdriver 1 and 2. But do check. When tightening, if you don’t have experience, use a torque wrench and follow producers torque recommendations. This is critical with carbon parts. If moving brake levers, bar tape will need to be unwrapped, then wrapped back again. It does get damaged when doing so. Do a few test rides to make sure the fit is right, before putting a new tape on the bars. Adjustments can be made to bar height, distance from the steering axle (and saddle), and angle. Depending on fork type, there are two standards and two ways of height adjustment. Explanation how to adjust height can be found in this post: Bar angle and height adjustment. Depending on fork type, procedure for height adjustment differs. Bars are set to the desired height. This is altered with changing the stem (length). 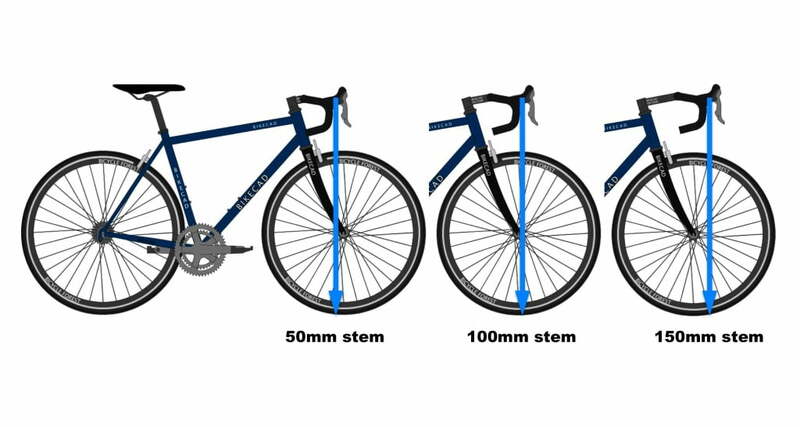 Bicycle with three different stem lengths. By loosening bolts holding the bars to the stem, bars can be rotated upwards-downwards. Bars can be rotated up or down. Bars on the right are rotated upwards compared to the ones on the left. 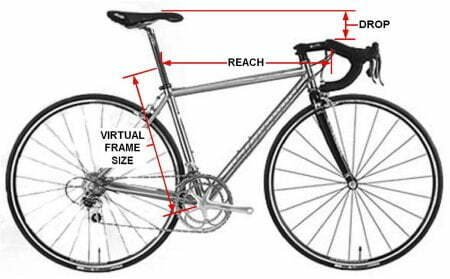 Before adjusting bars, make sure the saddle is properly set up, using these instructions: Setting up riding position – bike fitting. Set bars height so that top of the bars is about one or two cm below saddle height. 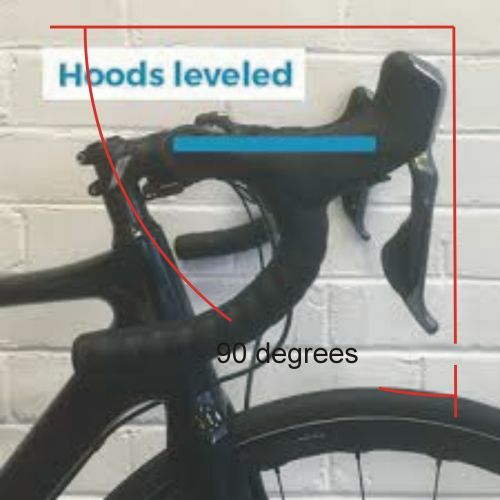 As a starting position, bars drop should be a few cm at most, or even level with the saddle height. Start with loosening stem bolts that hold the bars, so they can be rotated. Loosen them all equally by little. When fastening, fasten the opposite bolts, until all are tight. Sit on the bike (make sure it’s stable and stationary) and place hands in the drops. Rotate bars to a comfortable natural position. Don’t worry about brake lever, just rotate the bars so they are comfortable and feel natural in the drops. Set position and fasten bolts. Comfortable position is usually when the lowest part of the bars is parallel to the ground, or points slightly downwards (towards the rear wheel axle, or a bit higher). But the only correct position is the one that feels comfortable and natural to the rider. Sit on the bike, hold the bars in the drops, with hands slightly bent at the elbows. The bars should be blocking the view of the front wheel axle – it shouldn’t protrude from the bars by a lot in any direction (in front or behind). View of the front wheel axle over the bars. In the picture, up is the front side of the bike. This stem is on the border of being too short, but not too much of axle protrusion is visible so it’s probably acceptable. If the wheel axle is too far in front of the bars, the stem is probably a cm or two too short. 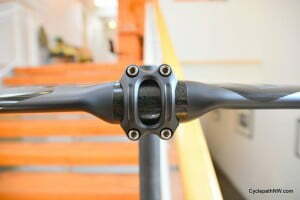 If the axle is far behind the bars, the stem is too long for a few cm. This is just a guideline method. Only extreme misalignment should be dealt with. 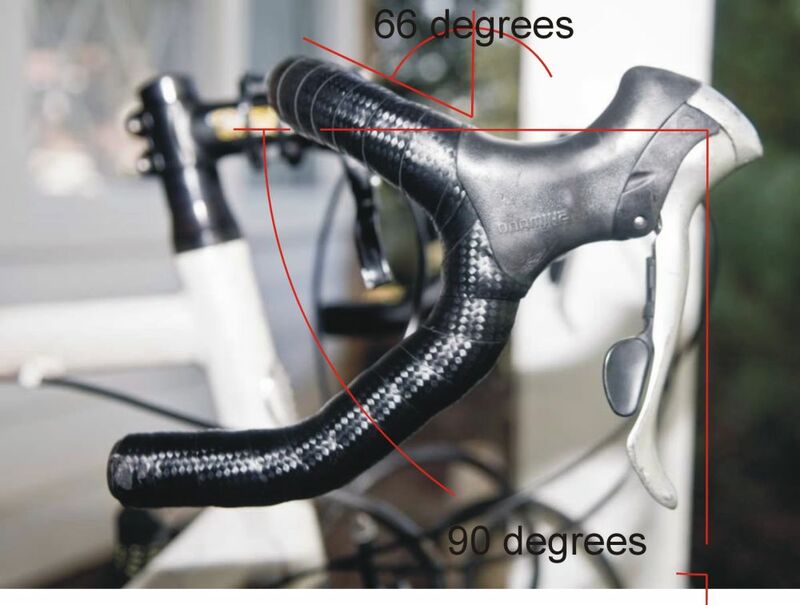 If it’s like in the picture above, don’t change the stem before a long test ride and doing some other tweaks explained here. The most valid test is a test ride. If during a test ride, rider feels cramped, like bars are too close and the front axle is seen in front of the bars (like in the picture above), stem is definitely too short. If, on the other hand, the rider feels too stretched in order to reach the bars and the front axle is visible closer than the bars (opposite side to the one in the picture above), the stem is too long. Now take a test ride. Check if all the bolts are tight. The emphasis is still on the drops. Brake levers should be left as they are for now. 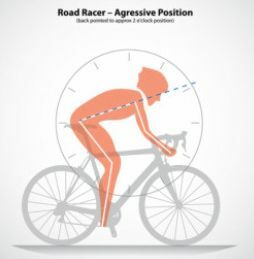 This position should be comfortable for over 20 minute ride period (in the drops). Rather aggressive riding position in the drops. Torso is almost level with the ground. Less flexible riders might prefer bars a bit higher set. If the neck is stiff from looking ahead and bending it during riding, bars could be set too low. Try raising them for a few cm and try again. If there’s pressure on palms and hands, first check if the saddle nose is tilted down. If it is, make sure the saddle is level with the ground. Then, check if the saddle isn’t placed too far forward in the post rails. Perhaps a post with a (bit more) setback is needed. If there is hand pressure with a saddle level, move the saddle 1 cm behind KOPS position for a start. 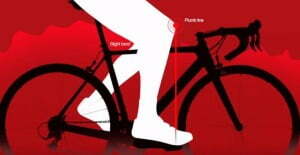 When pedals are parallel to the ground, knee cap is right above pedal axle. if the top of the bars is level with the saddle (or even higher), lower them for a few cm. if the top of the bars is lower than the saddle, first try lifting bars for a few cm. Now check for bar angle once more, step 2.2. Take a test ride again and see if the situation is better or worse. If it’s gotten worse, then change bar height back to the way it was, and then further a few cm in the opposite direction (if it was lowered, raise it and vice-versa). After a number of iterations, a comfortable drops position will be found. Give it time and patience, don’t expect to get it right at first. Just make sure you’re making progress, getting comfier and more natural with each alteration. 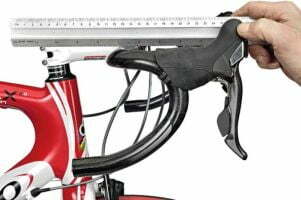 Experienced bike fitters can often just by looking at a rider on a bike get a 90% of the optimal setup – so the rider can just do minor tweaks later. After a comfortable position in the drops was found, it is time to set up brake levers. 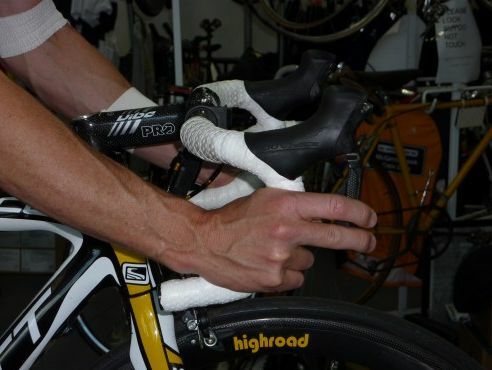 Unwrap the bar tape, then loosen clamp holding the levers. 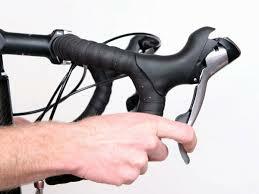 The procedure of loosening the clamp differs with type of brake levers. 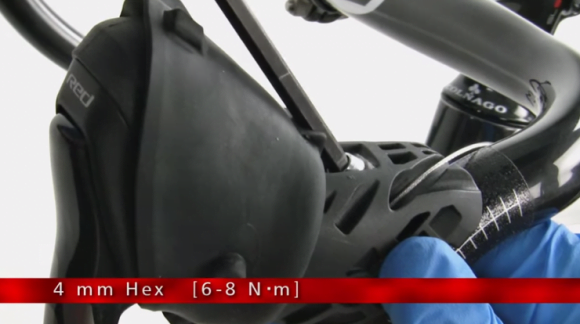 Check the user manual for the model on your bike. Usually it is a 5 mm allen screw, but not always. STI levers by SRAM – the bolt is behind the rubber covering the hoods. Then set levers so that the top part is level to the ground, or pointing up by a few degrees. Never pointing down. 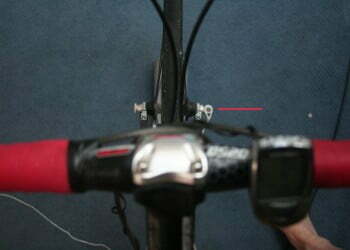 Brake levers should be about vertical. Remember to tighten lever clamps. Flat part for hand is a few degrees upward. Top part of the levers is almost level. Because of different bar shape, it appears as if levers are pointing up, more than they actually are. When it’s set up like this, levers are easily reachable both from the drops and from the tops (hoods). Riders with smaller hands might prefer setting brakes so that pads start braking when the lever is pulled by a cm or more, when they get the hold of the levers with whole fingers. Brakes set to grab when levers are pulled in a bit. MAKE SURE not to overdo it, there must be enough lever travel left for hard braking! The main merit is the rider. This is just for orientation, some average, “perfect” positioning. Hoods grab: Wrists are almost straight, elbows slightly bent, natural, comfortable position. Grab from the drops: Wrists are slightly bent, elbows a bit more. It should feel natural, without too much twisting. Finally, a “secret” that not everyone tells: levers can be set to be 100% natural and comfortable only for one position: hoods, or the drops. The other grab will be about 80% from perfect when everything is set up correctly. So either choose which position is more important to be set up perfectly, or go for a compromise, with both positions being about 90% perfect, but not 100%. Author’s choice for bars and bar tape from Amazon.com (click on the image to open Amazon shopping search). As an Amazon Associate I earn from qualifying purchases. 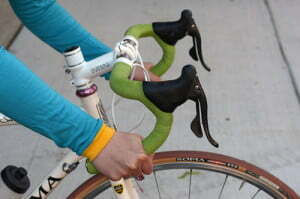 FSA Vero compact drop bars. Given widths are measured from end to end of the bars. 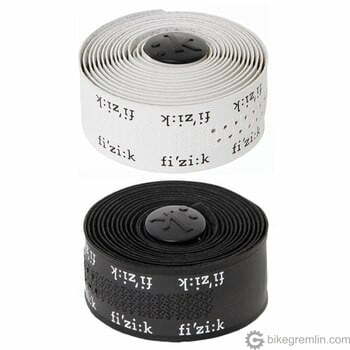 Fiz:k Superlight Classic bar tape. Durable and comfortable to hold, even with sweaty hands. Ty so much this! It helped a bunch!! When adjusting just the handlebar angle, i don’t have to undo the bar tape right? Coz the angle lof my handlebar is a bit up, and i’d like to make it neutral. No need to touch the bar tape, unless moving the shifters/brake levers up, or down. However, any significant change of bar angle might also call for lever re-positioning. Looking at the lever angle, it is actually perfectly positioned with the bar if they were in a neutral position. So i think i can move the bar without repositioning the lever.I’ll give it a try. Thanks for the reply. With the risk of stating the obvious, just in case: even in the “worst case scenario” – you don’t have to unwind all the tape – just from the top, to the levers (or including one turn just below them if moving them downwards).